Day two at market was really fun. The pace picked up in the NeedleDeeva booth. Shop owners were signing up for the Fab Firs, and were placing orders for the new canvases including the sugar skulls and the cats. 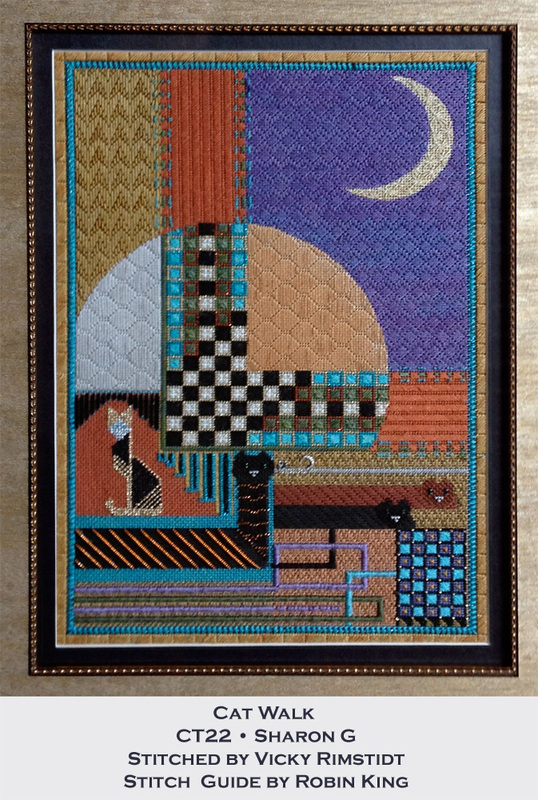 I am torn to which new cat canvas to stitch. So far #322 and #324 are both speaking to me... I wonder why? I took some time to visit some of my favorite designers. I will post those photos when I am back in front of the computer. Doors are opening for wonderful opportunities. Need to stitch faster. LOL. Tomorrow is the last day. Time to wrap up loose ends. Then it is off to teach at What's The Point. Today was my first official day at market. This was set up day for all of the designers. 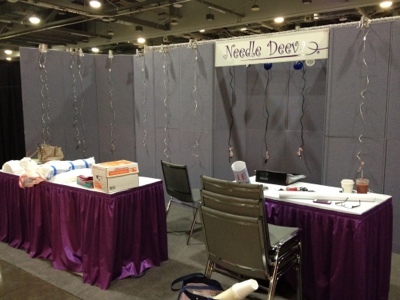 I took a few photos showing the progress of the NeedleDeeva booth. The first thing up was the walls, and then the lights, and then the Fab Firs banner. This year Team Deeva can consists of Judee (the Deeva herself), Chip (her son), Vicky and myself. Chip did an excellent job of setting up the walls, the lights, and the canvases. At 5 PM this evening was Sample It. So many shoppers. 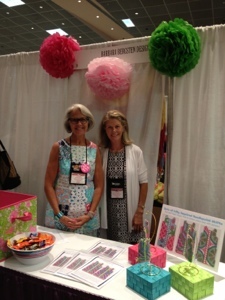 It was fun to see Barbara Bergsten and her Lily Pulitzer inspired canvases. I saw Mindy: love her new buttons for her new canvases. 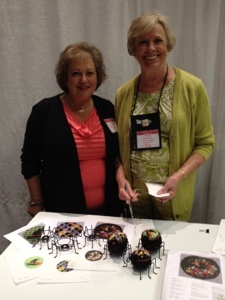 Associated Talents had new Halloween canvases with adorable spider leg stands. The Collection had new sequins and beads; I will be showing you them later. Tomorrow is the first full day of shopping for the store owners. It will be very exciting for them. 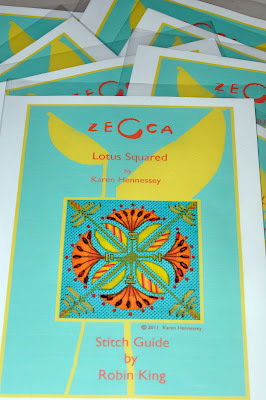 Also, early in the morning, I will be teaching the Lotus Squared canvas by Zecca. Hi everybody… Robin here... In Columbus, Ohio. The non-stop trip from Memphis to Columbus was wonderful. The person sitting next to me was a food inspector for the pet care company which makes dog food and cat food in Columbus, Ohio. I told her I have some cats who eat her company's food; it's a small world. 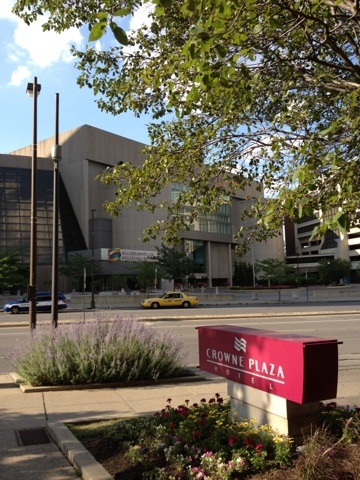 The taxi ride from the Columbus airport to the Crowne Plaza was very fast without any traffic drama. I saw Vicky de Angelis/Team Deeva in the lobby, and we had a lovely dinner at Martinis. 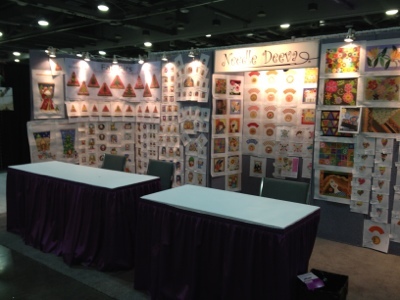 Tomorrow all of the fun begins: assembling the NeedleDeeva booth and attending Sample It. 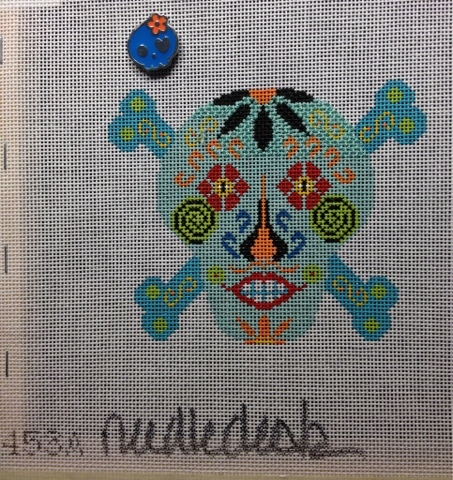 This evening I'm going to "chill out" and work on my blue Sugar Skull. He is my travel companion for the week. Like I said, I am blogging via phone, so please excuse any typos, non-labeling, or if the photos are out of sync..
Have a good night and I will talk with you again tomorrow from Columbus! This is a test to see if I can blog without using my computer. I am still packing getting ready to go to Columbus. 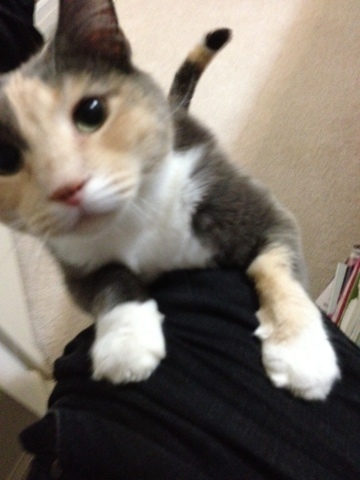 Jules the cat is very curious about the suitcase. I'm going to hit Publish and see what happens. See you in Columbus. I enjoy working with Judee/NeedleDeeva and being a part of Team Deeva. 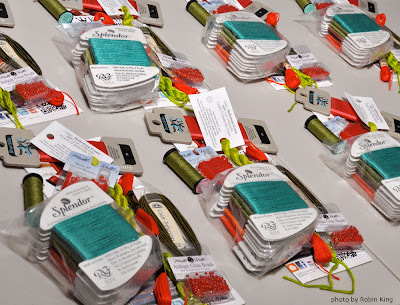 I have updated the NeedleDeeva website with previews of new designs coming to TNNA/Columbus. Take a look when you can. After photographing the finished Fab Firs for her website, Judee asked me to make a 6-foot banner which would be on display in the NeedleDeeva booth for both TNNA/Columbus and TNNA/Baltimore. I was thrilled for the opportunity. 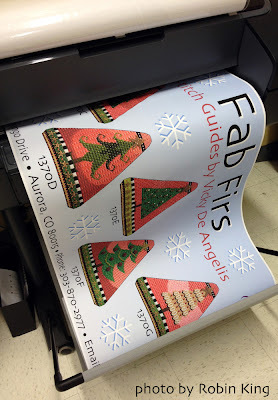 You've heard about the Fab Firs, haven't you? 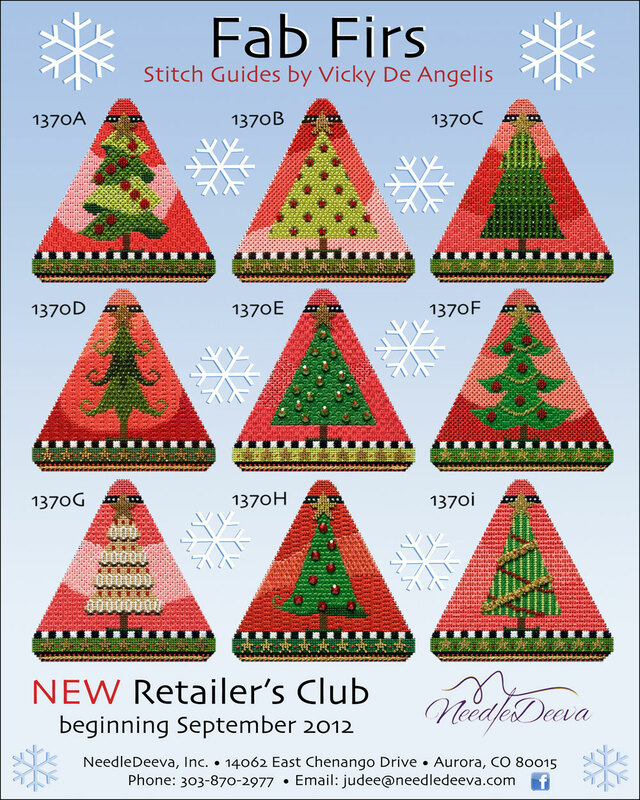 The Fab Firs are beautifully stitched by Vicky de Angelis, and will be the newest Retailer's Club offered by NeedleDeeva in September. 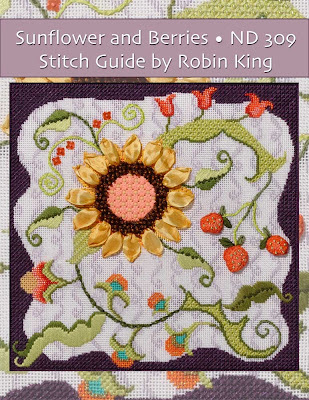 Vicky's stitch guides are wonderful and this is an awesome opportunity for all stitchers. All shop owners can contact NeedleDeeva to sign up for this club either in person at Market (Booths 803-805) or from the online information form on the NeedleDeeva website. 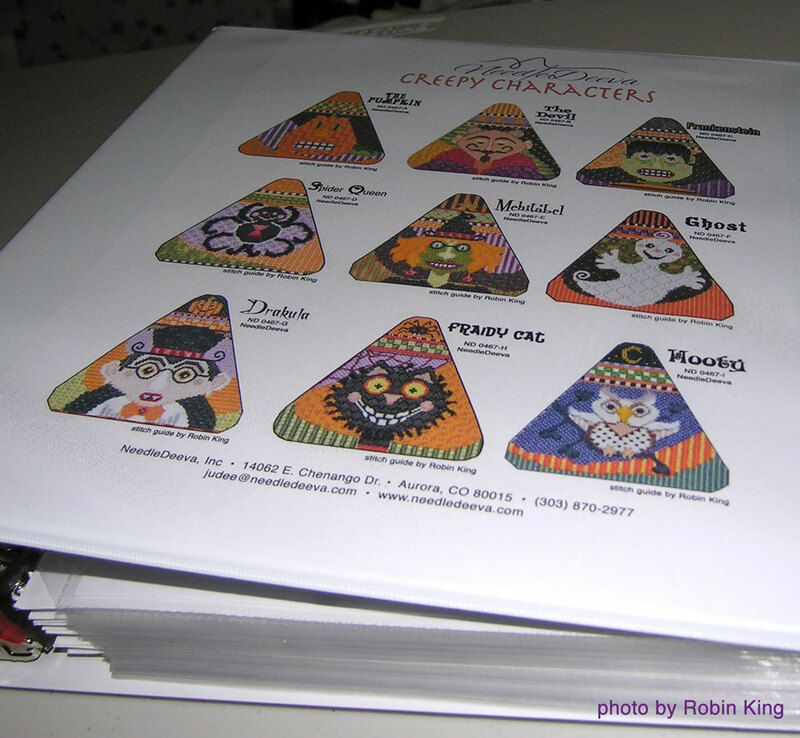 All triangles are the same size as The Creeps: 4.5" width and 4.5" height; on 18 mesh. 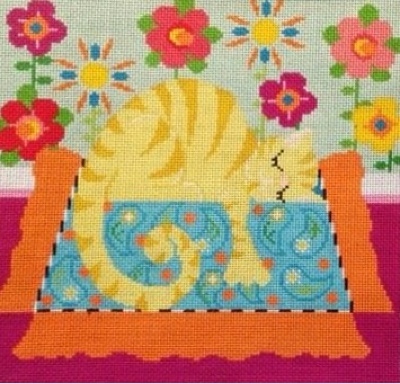 Needlepoint Now July/August 2012 issue, and decided to keep the same theme going. After all, that's what any ad agency would do, right? 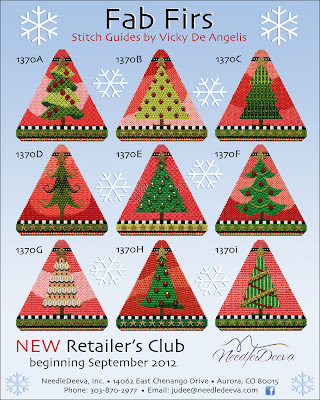 So now, we have the Fab Firs ad, the Fab Firs sell sheet, the Fab Firs page on the NeedleDeeva website, and... wait for it... the Fab Firs 6-foot banner. Ever have a 6-foot banner printed? 72" width by 24" height, to be exact. There was a slight learning curve involved but I did not give up. (The Deeva was counting on me.) Finally, the computer recognized the file, and then, the printer started printing. Oh, happy day!!!! I snapped this picture with my Phone and emailed to Judee about the blessed event... a banner is born. The Creeps are excited for their upcoming trip to Columbus. They love to travel and show off. I will take some photos of the trip and post them on the blog. Can't wait to show you this banner in all its glory. Happy Father's Day to all reading this blog. I credit my dad for many of my creative talents. Sure do miss him. 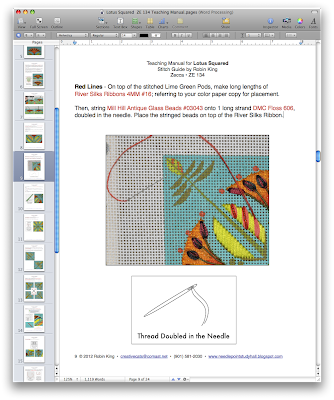 This week is the "gotta get it done" week because I will be heading to Columbus, Ohio to teach the Lotus Squared class at TNNA, work the NeedleDeeva booth, and then to teach at What's the Point? Needlepoint shop in Dublin, OH. Exciting times are ahead, for sure. 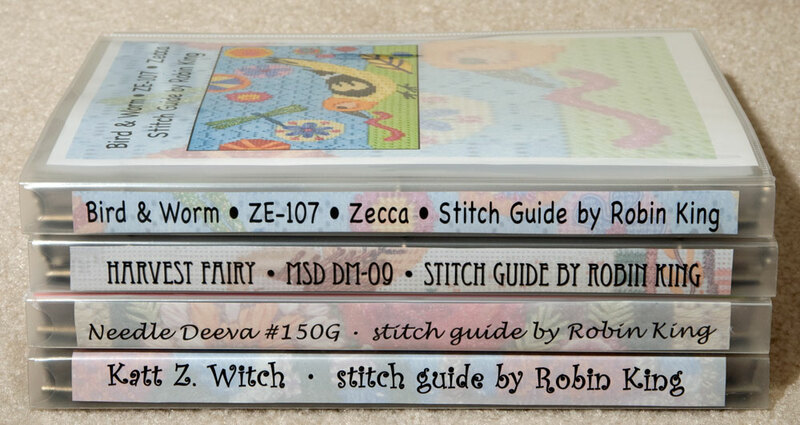 Then, I printed and bagged the stitch guides. 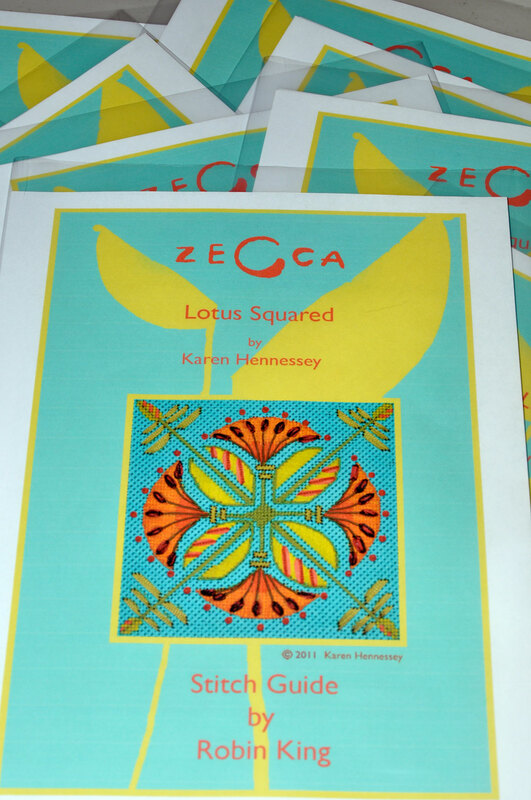 Zecca did the artwork for the cover sheet. I love her style. There are a few more seats available in the Saturday morning class. If you are a shop owner going to Market, be sure to consider spending 8AM - 10AM with me. 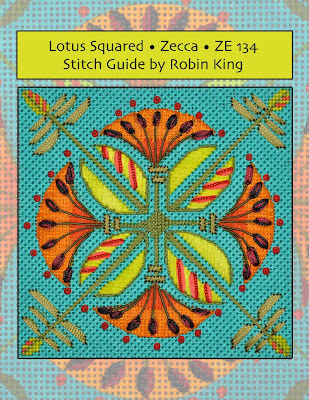 I also made my Lotus Squared Teaching Manual. It is a tradition I do for each teaching event. 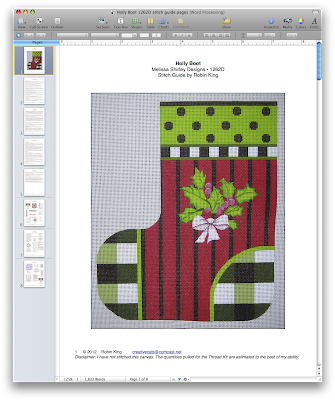 It is the same text as the stitch guides with large print and one design element printed per page. 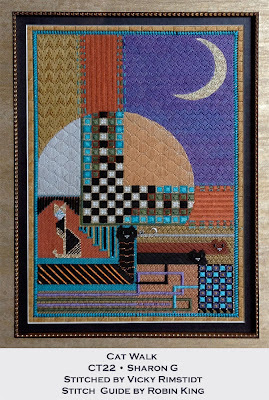 The charted stitch with a behind-the-scene photo are also printed as a reminder of what I did and when/how I did it. Each page is then put into a sleeve protector and into a binder which has a place for front cover and binder edge information. 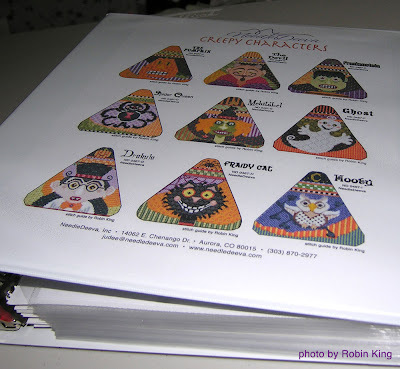 Blog readers who have been with me from the beginning may remember my earlier teaching manuals. I also have the Sunflower and Berries Teaching Manual ready to go with me because I will be teaching the class at What's the Point? 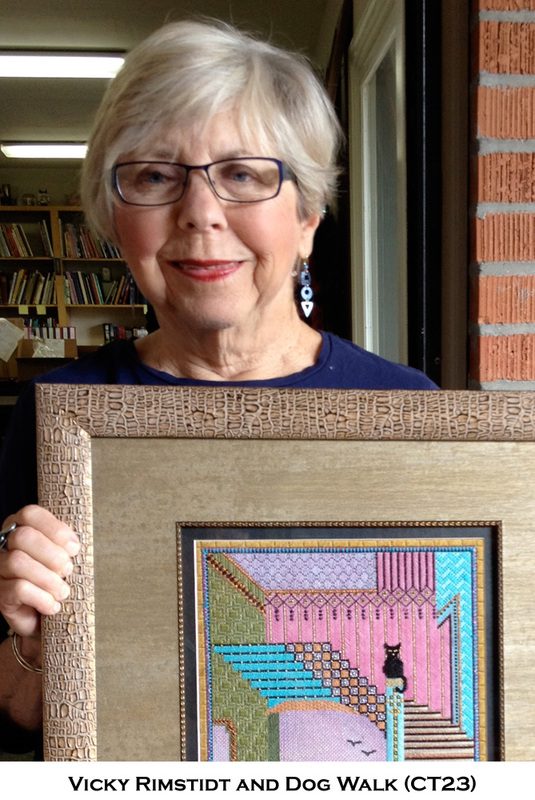 Needlepoint in Dublin, OH right after Market on Tuesday, June 26th. 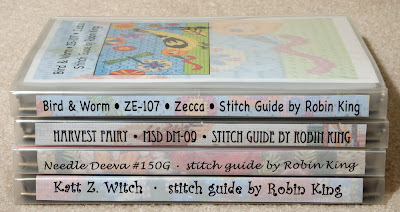 My collection of Teaching Manuals is a reminder of the commercial stitch guides I have written. Looking forward to more opportunities... beginning in Columbus. 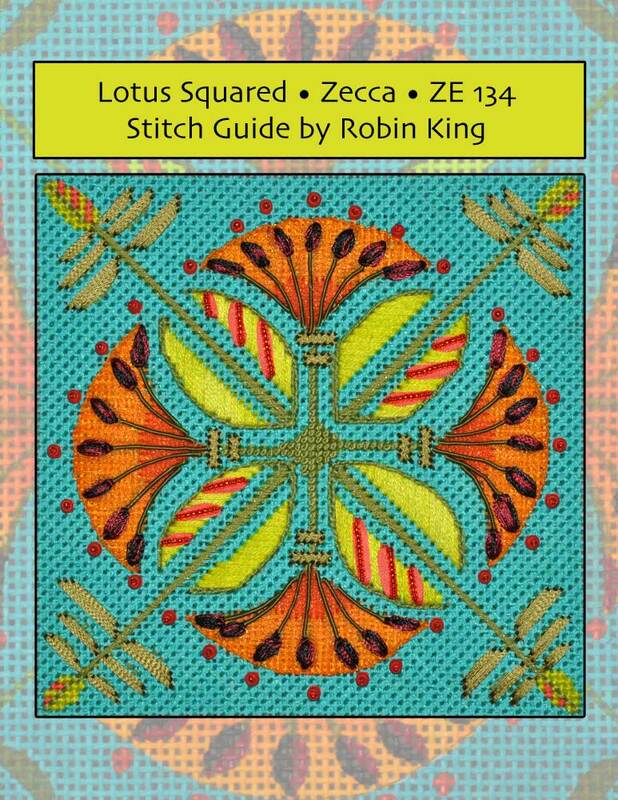 Labels: Lotus/Zecca ZE 134, Needledeeva, Robin King, Sunflower and Berries (ND 309), teaching manuals, TNNA/Columbus, What's the Point? Today is Show and Tell day. Vicky Rimstidt is one of the ladies who attends my canvas enhancement classes. 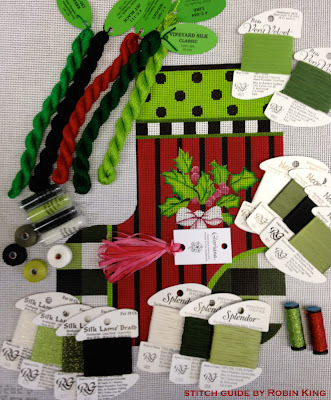 She is an avid stitcher and a wonderful friend, too. On Saturday, she brought in her two finished/framed canvases. You can imagine the "oohs and aahs" from the other class students and me! 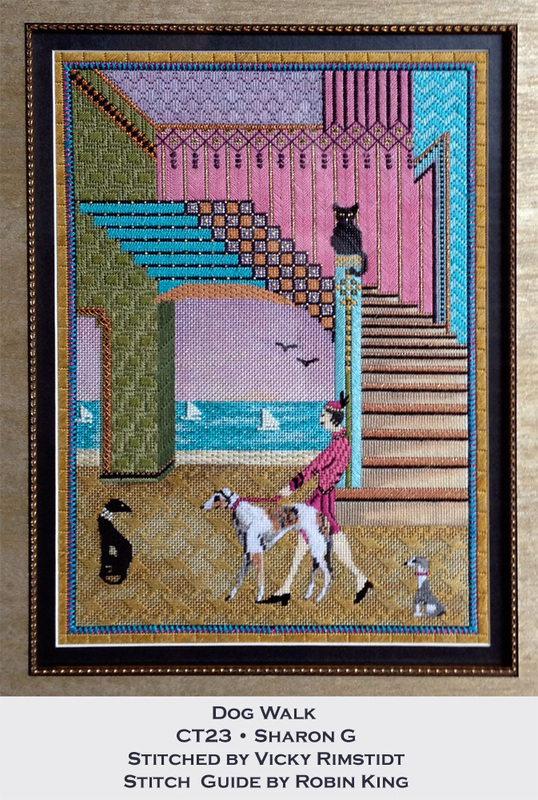 Vicky Rimstidt had been stitching Cat Walk (CT22) and Dog Walk (CT23); each canvas is on 18 mesh from SharonG. This has been a fun journey for both Vicky and myself. The first piece we planned was Cat Walk. Beads, Kreinik, Gloriana and Rainbow Gallery threads brought this piece to life. Then it was Dog Walk's turn. 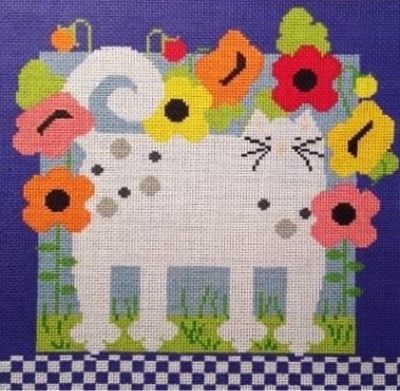 You might recognize it as being similar to Deco Kitty (from Vicky de Angelis' blog), and you would be correct. 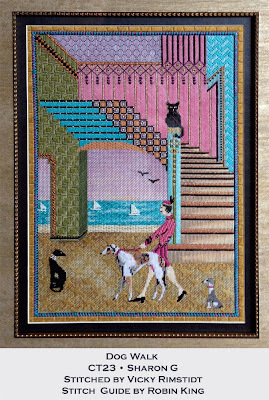 SharonG first designed Dog Walk, and then, later painted the cat-only version for Vicky de Angelis, a passoniate cat lover. SharonG is one clever lady, right? Click to see more of SharonG's designs. Now both pieces are finished; framed and hanging for Vicky Rimstidt to enjoy. Thank you, Vicky, for today's Show and Tell. We will enjoy seeing your work again and again. I tend to wear several hats with all of the different jobs going on. But, then, I am sure you do, too. I also like to call it "Spinning Plates"... my old-school reference from the Ed Sullivan television show days when Ed featured the performer with tall bamboo poles and white dinner plates. The man would balance and spin a plate at the top of each pole. Poles 1, 2, 3, 4, 5... all going at the same time. All would be OK until the first plate began to wobble and almost fall. The man would run back to the first plate, increase its RPMs to save the plate from crashing. Then, he would continue moving forward... giving plates 2, 3, 4, 5 an extra spin... and then would begin setting up another pole/plate combo. Back and forth the performer went. I have such fond memories of this performer and the lessons it taught me. Spinning Plates... it says it all, don't you think? (MSD 1262-D) for a stitch guide. 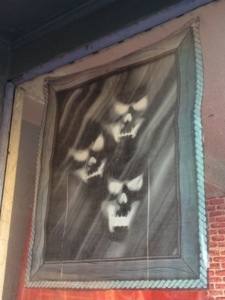 There are four separate canvases on 13 mesh: two sides, a front and a back. 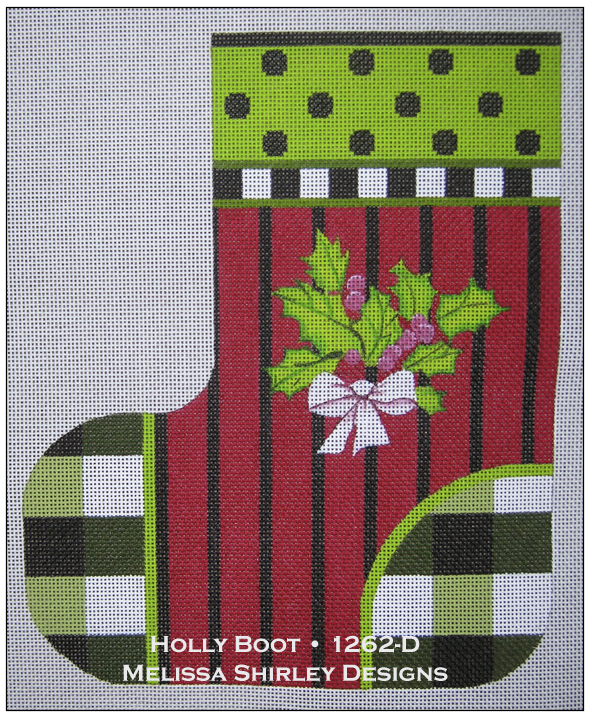 Once finished, it turns into a 3-D boot... ready to fill and become your next special holiday decoration. I had always admired this design and was looking forward to see what would inspire me. Click to see all of the Melissa Shirley 3-D Christmas Boots. 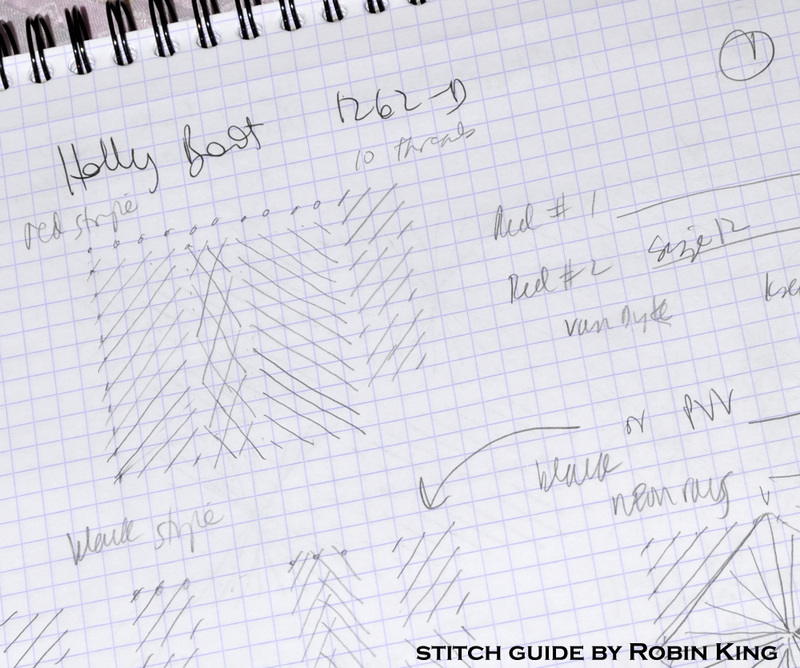 I usually begin each stitch guide with graph paper and pencil. I draw out some ideas and identify colors which will need threads. Sometimes I know exactly what thread to use, and other times, I might give myself options for consideration. Then, I go and selected the threads; wandering around the store with canvas in hand and imagining the possibilities. Pulling threads is thrilling to see the canvas come to life. 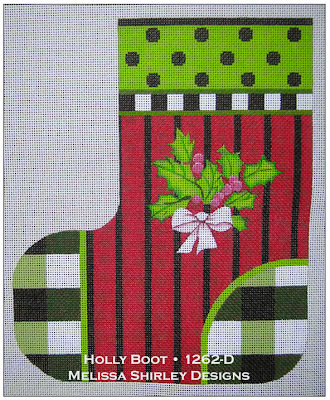 Look how much fun this 3-D Holly Boot will be to stitch... and you haven't even seen the stitches. My last thing to do is to type all of the "fill in the blanks" for each of the selected threads, and chart all of the stitches. 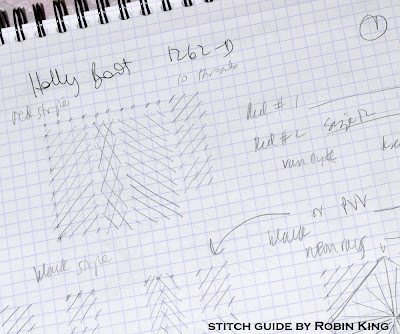 This stitch guide has 24 charts. I also write up the Master Thread List to have on hand; just in case (hopefully!) 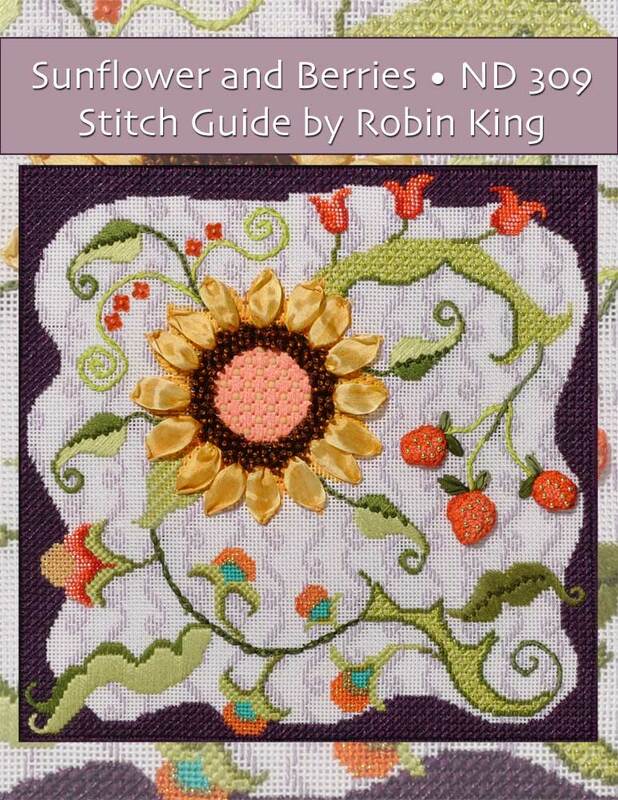 someone else orders the stitch guide. The 3-D Holly Boot stitch guide is now finished and will soon become a wonderful family heirloom. As for me? I am ready to catch my next Spinning Plate.